Written by: KristaG on March 28, 2018. 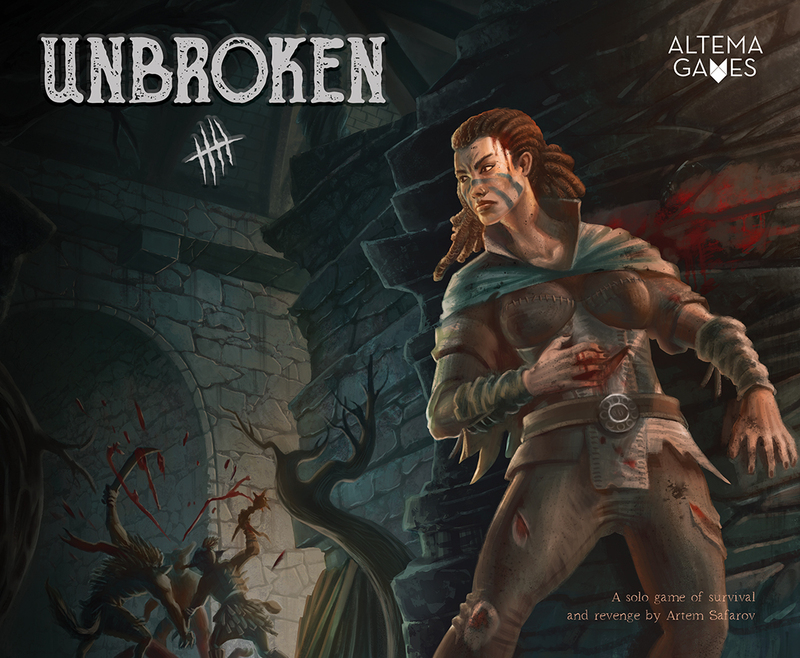 Cover art for Unbroken by Altema Games! Have you ever played a game where you’re part of a party and whilst adventuring, everyone dies? Well, Unbroken is sort of like that except you didn’t die like everyone else. Instead, you survived the TPK (total party kill)! As you awaken from whatever disaster befell your party, you find yourself wounded, weakened, and deep in enemy territory! There are several choices available to you: give up and wait to join your fellows in the grave, muster up your courage and try to escape, or claim your revenge and fight your way out! If you’re like me, you choose the latter of the three options and you settle in for an action-packed game of Unbroken from Altema Games! Artwork from Cauldron compared to the artwork from Unbroken. Similar, but also very different! Being an actual solo game already makes Unbroken a game that gets my attention. There aren’t many out there that I have fallen in love with or deem as “must haves” (thus far, I think the games from the “Oniverse” are the only exception to this) and many of them are really more like co-op games with one player playing as everyone, which is not quite the same as a true 1-player game. To be honest, I have been waiting for what feels like forever for another game by Artem Safarov and the Altema Games team. I absolutely fell in love with their last game, Cauldron (which you can read about here), and am still thrilled to have stumbled across that gem as their Kickstarter campaign back in April of 2015 was completely off my radar! That being said, Unbroken is a game that I have been hyped about for months! Now that I’ve finally gotten to play it, I would have to say it was worth the wait! Nikolai Ostertag joins Alina Marchewka for the art in Unbroken, giving the game more of a dark and grim feel than that of Marchewka’s work with Polina Radtchenko and Christina Simmons on Cauldron. The covers of both games were drawn by the same artist: Jacob Atienza, which may also explain some of the similarities and the appeal it has for me. The art itself, though dark, is absolutely gorgeous and unbelievably detailed! My set up for Unbroken using one of my favorite characters (I am torn between the Sneak and the Huntress). Please note this review was written using a Print and Play version of the game. Setting up a game of Unbroken is actually a bit of a process. There are 4 characters to choose from: Brawler, Huntress, Sage, and Sneak. 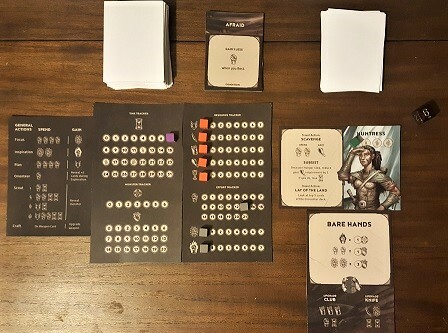 Once the player has chosen their character, find the Bare Hands weapon sheet and place that beneath the character sheet in the play area (a.k.a. “display”). There are also 3 other display sheets that go in a player’s “display”: Time/Monster sheet, Effort/Resource Sheet, and a Reference Sheet. To start, place a token on the indicated space on the Time Tracker (marked by a ‘\’) to show 7 time. Another token is then placed on the 13 in the Small Effort tracker. Every other resource on the Effort/Resource Sheet should have a token placed on the 0 icon (this includes Medium and Large Effort). On the player’s character sheet, yet another token is to be placed on the leftmost space of the character’s ability bar. That completes setting up the “display.” Next, separate out the Skill, Condition, and Encounter decks. The Skill and Encounter decks are both shuffled and placed face down in their respective decks. Players will want to ensure that there is space for a discard pile next to each of these 2 decks. The Condition deck, however, is not shuffled and is placed face up. 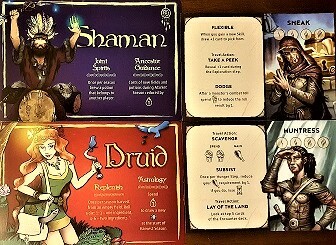 A few of the possible Encounter cards that a player may come across while traveling around in the dungeon! Holding true to the theme of a dungeon delve gone awry, Unbroken is played with levels instead of rounds. There are 4 levels and each level is composed of 2 phases: the Travel Phase and the Combat Phase. While these sound fairly self-explanatory, there’s a bit more to them than just wandering around picking up discarded gear and searching for monsters to get revenge on. The Travel Phase, for instance, is made up of 3 steps: Preparation, Decision, and Exploration. When in the Preparation step, the player may take as many general actions as they would like as long as they have the resources to do so. 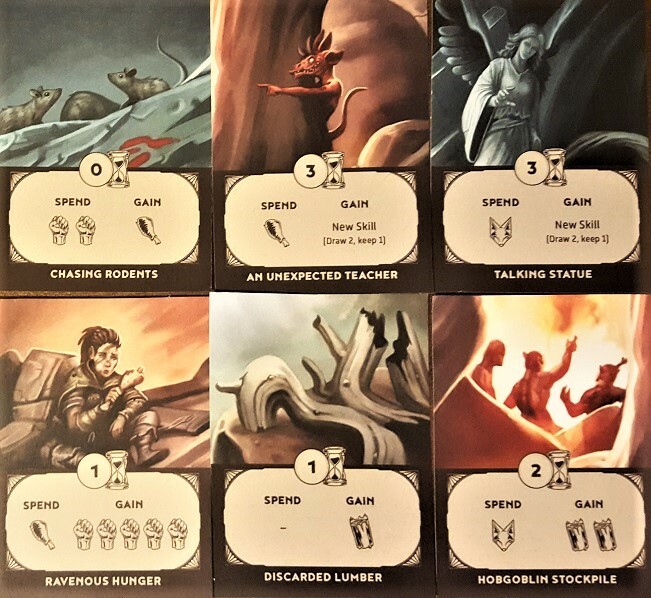 These actions are all listed on the Reference Sheet but include things like weapon crafting, scouting, orienteering, and various methods of gaining resources (Cunning, Medium Effort, or Large Effort). Once the player has finished preparing, they must next decide if they are ready to move on to the Combat Phase or if they would prefer to enter the Exploration step of the Travel Phase. During the Exploration step, the player will draw 2 cards from the Encounter deck (this number can be modified by an effect), choose which one out of the 2 to keep, and discard the remaining card. Once this is done, the player gets to decide if they want to resolve the encounter or rest. Be wary of encounters, however, as monsters are known to ambush wandering heroes, but the rewards that can be gained while exploring can be well worth the risks! Resting, though, is not always a bad idea as it allows the player to regain some of their Small Effort resource. If the player wasn’t ambushed during their encounter, they have the option to repeat the Travel Phase in its entirety as many times as they’d like until they are either ready to enter the Combat Phase by choice or are forced into it after being ambushed by a monster! Several of the Monsters that can be encountered during a game of Unbroken. Notice the slash marks on the right side of each card? That tells you what level of the dungeon each monster has the chance to spawn on! Like the Travel Phase, the Combat Phase is also made up of several steps: Ambush/Trickery and Battle. The Ambush part of the Ambush/Trickery step only occurs if the Time Tracker reached 0 during the Travel Phase. What happens during an Ambush is described at length in the rulebook, but is also fairly similar to the Trickery part of the Ambush/Trickery step. Either way, when entering the Combat Phase, the player must first roll a d6 if the monster for that level has not yet been revealed. 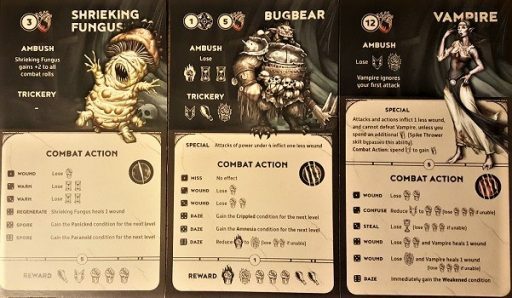 Each of the 24 Monster Sheets are marked with a number of slash marks on the right side of the card to indicate which level they will appear on. They are also all numbered 1-6 to coincide with the possible outcomes of the die. Once the player has found the corresponding Monster card and set it in their play area, they must reset their Time resource bar. The token needs to be moved to the icon that matches the next level of the dungeon (so if fighting on level 1, the token goes on “\\” or space 12). If being ambushed, the Ambush effect must be resolved before entering the Battle step. Otherwise, the player is faced with yet another decision to make. Do they want to try to trick the monster and avoid the combat altogether or do they want to fight and exact their revenge? Should the player choose to trick the monster they do, of course, give up any rewards they would have received from the combat. If entering the Battle step of the Combat Phase, there are numerous rounds of combat by both the player and the Monster until either the Monster is defeated or the hero collapses in defeat from their wounds and pure exhaustion. If, and I do mean if, the hero survives the raging battle, they are rewarded with a new skill! If you manage to escape the dungeon, compare your final score to the chart to see just how successful you really were! However, just because the monster was defeated doesn’t mean the level is won. After spending all of that effort, the hero must eat to regain their strength to continue. Don’t have enough food stocked up to eat? The player can push their luck a little and choose to spend Small Effort in place of the missing food. If they still can not meet the food requirements, they are defeated by their own starvation! Should the hero manage to satisfy their hunger, the player levels up and places a new token on their character’s ability track equal to the level of the dungeon they’re about to enter. Any previous conditions are removed from the character and placed back in the character deck, but any new conditions that were gained during combat will go into effect for the next level. This is one brutal dungeon and it only gets harder the more successful you are as a player! The game ends in only one of two ways: either the player is defeated in battle or via starvation or they have successfully defeated the final monster on Level 4 and proven that no matter what the dungeon threw at them, they were indomitable! If successful, there is a score chart to determine just how successful the player was. I’ve got to admit, I lost this game far more times than I have ever won it. However, I like a good challenge and I’ve enjoyed watching my friends try and beat the game. At this point, it has become a bit of a competition to see who can get the farthest before succumbing to defeat. If we get to the point where we all beat it more often than not, then I’m sure we will compete for final scoring. I like that there is a ton of replayability and some serious action packed into this little box! It means that we can keep playing it over and over while trying to best one another without getting bored anytime soon. The theme may be a bit dark for kids and I would go so far as to say it is more of an adult game due not just to theme, but because there is quite a bit of strategy and depth involved. Even with the level of strategy, however, the game is still pretty light when compared to other survival games I’ve played. As I said above, I can not get over the artwork for this game and I am so glad I got a chance to check it out! Unbroken is currently live on Kickstarter and, for me, it is an “instant back” with my full support for sure!